Due to weather extremes and inadequate construction, some of the homes in Fair Lakes experience flooded basements or other forms of water damage. Having excess water in your basement is unpleasant on all counts, but before diving in head first, it is important to understand where the water is coming from. There are numerous possibilities for the water to find its way into your basement including plumbing leaks, wall cracks, poor drainage systems, or a faulty sump pump. By having the proper sump pump installed, your basement won’t be exposed to as much damaging water so you can fix the problem before it starts. 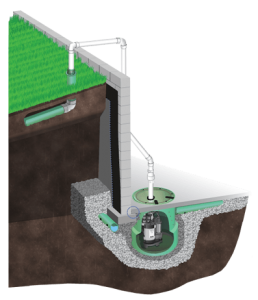 Basement Masters Waterproofing offers a dual combination sump pump that will help to protect your basement. With a battery-operated backup pump that automatically starts if a problem arises, you won’t have to worry about your sump pump anymore. At Basement Masters Waterproofing, we offer multiple solutions to your problem for basement waterproofing. The easiest solution would be to simply install an internal basement waterproofing system, and while this will help to eliminate moisture, it is not as effective as an external system. No matter how it’s done, Basement Masters Waterproofing excels at basement waterproofing for Fair Lakes, Virginia. One way to fend off unwanted water is by maintaining your foundation. A settling foundation can cause damage throughout your home, leading to sloping floors, leaning walls, and sticking doors or windows. Ultimately, if residential foundation repair is not performed, the entire house could collapse, due to the unstable foundation. A flooded basement or settling foundation can damage your property and endanger the health of you and your family. These are not problems that you can repair yourself, make sure you have an expert team like those at Basement Masters Waterproofing on hand to do the work. Call today for any of your basement or foundation repair needs in Fair Lakes, Virginia.